Although singer Pat Byrne won the grand final and a 100,000 euro recording contract with Universal Music, the real stars of TV talent show ‘The Voice of Ireland’ were NEXO’s distinctive 45°N-12 stage monitors, playing a prominent role at the centre of RTE’s stage set. Together with a substantial NEXO GEO S8 PA system for The Helix venue where the shows were recorded, Dublin-based rental company Sound Design provided audio equipment and 12x N-12 wedges to set designer Fiona Cunningham and production company Screentime ShinAwil. The unusual triangular shape of the N-12s was exploited in full by arranging them in two circular groups between the judges’ armchairs and the performers’ position on stage. Out of each group of 6 speakers, 3 were delivering stereo monitor mixes forward to the performers while the other 3 were providing foldback to the judges. The NEXO systems were installed in the 1260-seat Mahony Hall at Dublin venue The Helix for a period of 9 weeks, handling the production of nine live shows, which whittled down the final 24 contestants from a starting total of nearly 2000 at the beginning of the year. John Vickers’ design for the production featured left/right arrays of 8x S805s with 2x S830s, and 3x RS15 subs each side, with 12x PS10-R2s for fills and hot spots. “The set designer also made a feature out of the PA hangs, highlighting them with sparkling string ‘curtains’. 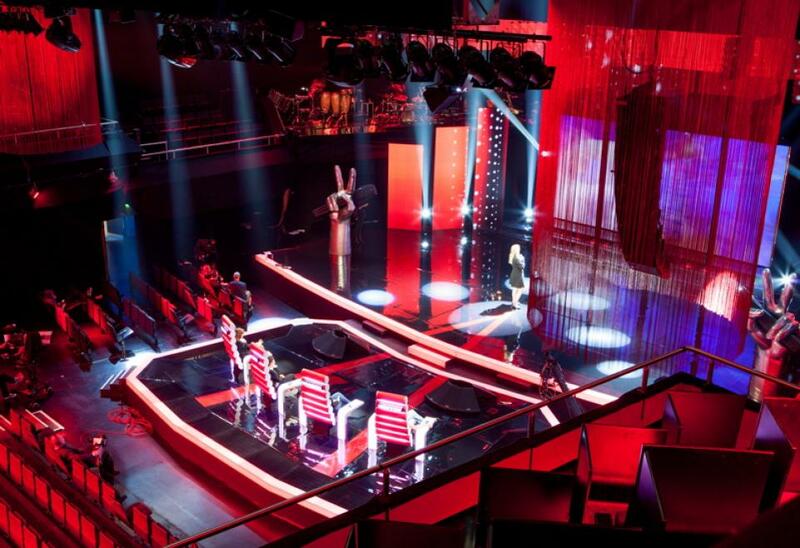 ‘The Voice of Ireland’ is the Irish edition of the international TV franchise ‘The Voice’, a reality singing competition created by media tycoon John de Mol. The main premise of the show is the quality of the singing talent, which is selected in blind auditions where four coaches/judges can only hear but not see the performers. These four coaches themselves are popular performing artists; in Dublin, the panel featured The Corrs musician Sharon Corr, Westlife member Kian Egan, Eurovision finalist Brian Kennedy and The Blizzards's lead vocalist/guitarist Bressie.